Zecharia SITCHIN translated clay tablets, statue bases and monuments scribes inscribed in ancient Sumer (now Iraq). The inscriptions said how extraterrestrial gods created and conditioned us and Michael TELLINGER excavated ancient settlements in South Africa. This information can free us to end war, persecution, short lives, famine, disease and pollution. The tablets Sitichin translated show the Sumerians’ version of our solar system’s history for the last 4.5 billion years. 300,000 years ago, the tablets say, the ETS added their genes onto Homo Erectus’ to create EARTHLING-SLAVES. 13,000 years ago, as the ETs’ planet, NIBIRU, neared Earth, the Antarctic icesheet slid into the South Sea and caused the DELUGE, the ETS let most of the hybrid Earthlings drown. ETS also nuked Sodom and Gomorrah in 2024 B.C. and decimated the Earthlings of Sumer with radiation. Nibirans with advanced weaponry and biological pathogens murdered hundreds of thousands of Earthlings. The ETs, whom the scribes called “gods” (the Bible’s Elohim), dictated the tablets and statue tags. Statues show the ETs looked like 7- 12 foot (and taller) Swedes with SPACE-AGE WEAPONS. 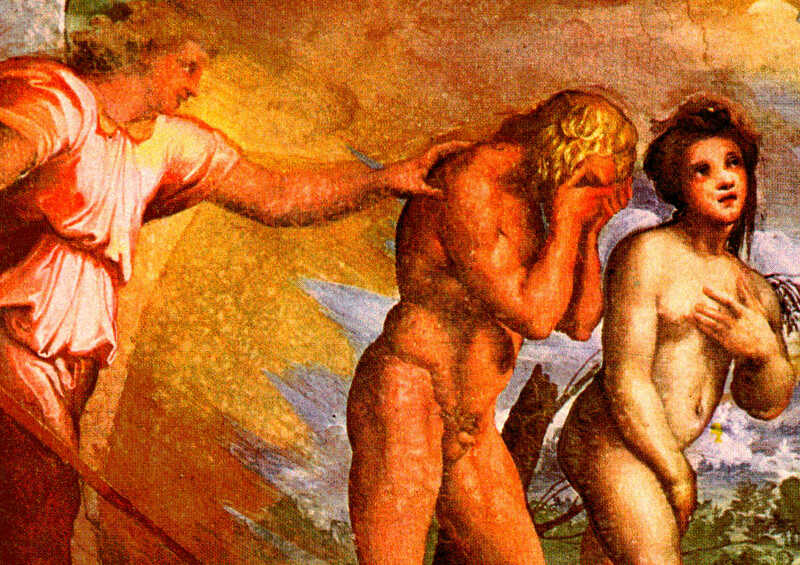 These so-called “gods” lived millions of Earth years. They said an ATMOSPHERIC CRISIS 445,000 YEARS AGO ON NIBIRU drove them to Earth for gold. Most Nibirans left Earth in 2024 B.C..
Nibirans shaped our societies, bodies, thoughts and consciousness. They scripted us to OBEY MALES RANKED IN HIERARCHY, TO DISDAIN UNDERLINGS AND PERPETRATE VIOLENCE. 445,000 ago, Ea (Ptah, Buzur, Hephaestus, Vulcan and Adoni), a Nibiran Sumerians called ENKI, rocketed to Earth with fifty men. 50 Medics, 600 miners and 300 astronauts and administrators followed them. The Expedition sought gold to refine to floating monoatomic white powder of gold and create a suprerconductive shield for Nibiru’s decaying atmosphere. Sumerians named the Nibirans ANUNNAKI–those who came from the sky. Israelites called Nibirans Anakin and Nefilim; Egyptians called Nibirans Neter (Watchers). The Anunnaki found GOLD aplenty in Africa and South America. Enki incited the African miners to strike, then pressed Enlil (aka Yahweh), the Expedition Chief, to pardon the strikers. Enki would, he said, breed short-term MINING SLAVES to replace the striking Nibirans. To make the slaves, Enki added his genes, his sister NINMAH’s mitochondrial DNA and genes of Homo Erectus. Enki thought the Creator-of-All designed Erectus to evolve into Homo Sapiens. 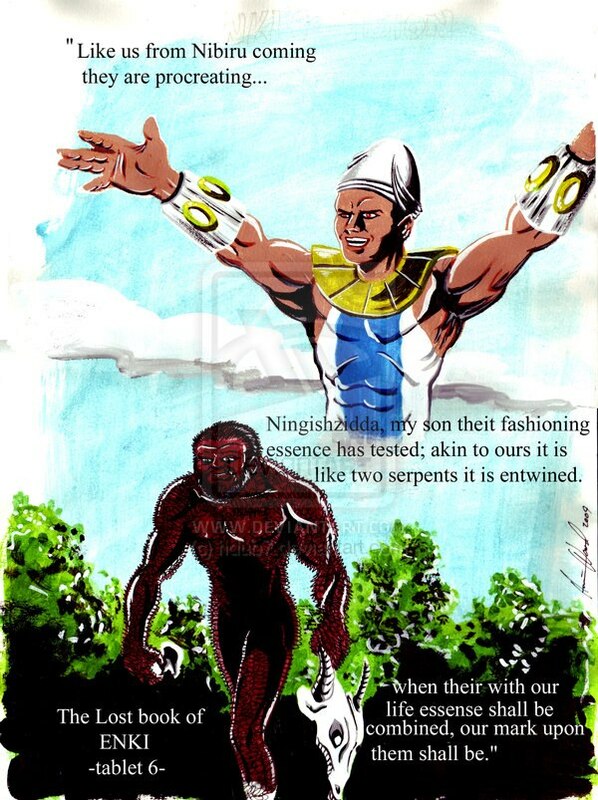 NINGISZIDDA–Enki’s son, Ninmah and Enki expedited the Creator’s design; they made hybrid Earthlings who could breed. We were like Nibirans, though they had longer heads and bigger brains. Enki made our men with foreskins Nibiran men lack. Enki created our ancestors. He and the Nibirans on Earth begat babies with each generation of us Earthlings. Nibirans trained us to mine gold and copper. We tended their crops, livestock and mansions. From 300,000 years ago until the Great Flood, millions of us toiled for the ETs in South Africa. After the Flood, 13,000 years ago, Expedition bosses had us call them “gods.” They made us build temples, palaces, hangars and cities in Sumer, Egypt, Mesoamerica and South America. They taught us ASTRONOMY, METALLURGY, MATHEMATICS, AGRICULTURE, HERDING, WRITING, ARCHITECTURE AND GEOLOGY to support cities and palaces. They owned and ruled us. Descendants of ENLIL, Commander of the Nibiran Goldmining Expedition, whom Sitchin called Enlilites, ruled the Earthlings of Sumer and India. Chief Scientist Enki’s descendants, whom Sitchin called Enkiites, ruled the Earthlings of Africa, Basara (then called Edin) on the Persian Gulf and Bagdad (then called Babylon). Enlilites and Enkiites pitted Earthling armies against each other. The pushiest Enkiites, Babylon’s god MARDUK (aka Ra and Nimrod) and his demigod son NABU, raised fifth-columns in Canaan and sent Earthling armies to wrest the Sinai Spaceport from the Enlilites. In 2023 B.C., ENLILITES NUKED the Spaceport and the cities south of the Dead Sea to keep the Spaceport from the Enkiites. FALLOUT from the bombs spread to Enlil’s Sumer but not Marduk’s Babylon; Babylon nestled north of the nuclear cloud. Sumers Enlilite gods fled, but their Earthlings in Sumer, except for those at Edin, whom Enki saved, died. Marduk ruled Sumer for awhile. The ETs and the bloodlines of hybrids closest to them genetically (they begat babies on each generation of hybids) still rule Earth. They chain us in matrices of religion, war and business. Power hierarchies dedicated to Yahweh and Allah compete to the death. Sumer’s history warns us to cast off the hierarchical godspell and mind-set of the Nibirans–Enlil, the patriarchal and genocidal Nibiran Commander who left Earth in 2024 B.C. as well as woman-degraders Marduk and Nannar and mass-killer Inanna who stayed on Earth. Nibirans taught us to war, fight, enslave, slave, defoliate and pollute. Each Nibiran god made us obey blindly. Some Earthlings fled mines and cities of the gods, hid in hinterlands far from ET abuse and wars, no longer fodder for spears, arrows, chariots, explosives, lasers, gas and biological agents. Science confirms what the ETs saw and charted when they rocketed to Earth from beyond the parts of the solar system Earthlings could see. The Nibirans saw Earth as they neared it from space outside Neptune’s orbit. They saw Earth recede as they rocketed to rejoin Nibiru as it moved past Neptune to orbit around Nemesis. Nibirans gave us physics, astronomy and biology better than we have now. Just nowadays, researchers verify genetic, metallurgical, geological, mathematic and astronomical data. We validate with hard data predictions and principles inscribed on the ancient Sumerian tablets dictated, say the Sumerians, by ETs. The Erectus in us–the short-lived hominid the Nibirans altered–resonates with Gaia, this planet and with a natural cooperativeness and capacity for interspecies empathy the Nibirans lacked. When we know and balance our Nibiran and Gaian energies, we break the godspell, become peers rather than servants of the gods. We embrace both our Nibiran and our Erectus natures, our capacities to strive and compete as well as capacities to support, encourage, love and celebrate every consciousness. Please keep me regularly updated for direct from the source referals to my stdents for Cosmic Studies/History & Development of Terran Civilization.